Iris Borraz Magdaleno, selected at age 23, has a Bachelor’s degree in Marketing from the University of Valladolidad, Yucatán, and holds Diplomas in Sales Management, Marketing, and Neurolinguistic Programming from the Technological University of Monterrey. Her professional experience includes working in eco-tourism in the Mayan Riviera. She worked as Assistant for the University of Valladolid upper management, creating Marketing Plans. Her main areas of expertise are program planning, leadership, financial planning, media, and statistics. These are areas which she has worked in to create studies and projects for electoral candidates and businesses to address issues around youth and women in abusive situations. 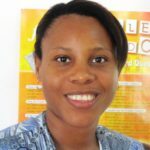 Iris is passionate about gender equality and works to contribute to the elimination of abuse and exploitation of children.